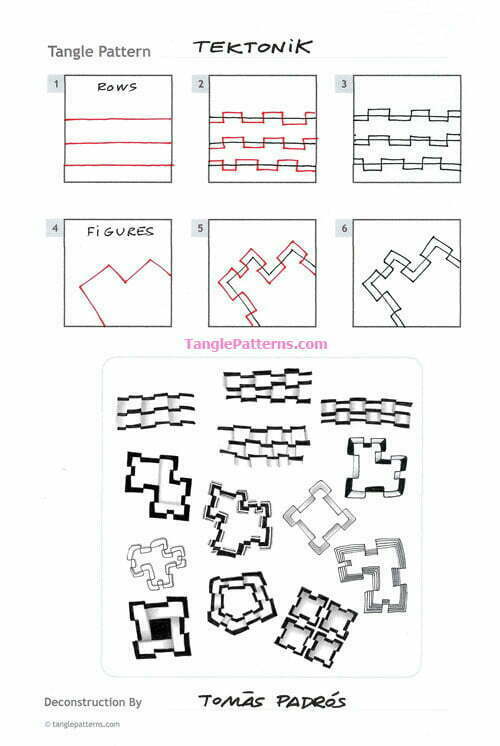 Tektonik is the second tangle today from Spanish tangler Tomàs Padrós. It is a more complex form related in concept to his earlier Broadway tangle. 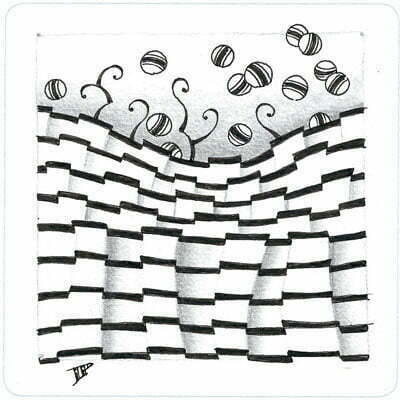 Tektonik has SO many variations which Tomàs illustrates with several tiles of his own explorations with different forms. For starters, lets take a look at his lively Zentangle® tile featuring Tektonik with the Zentangle-original Jetties, and CZT Margaret Bremner’s Krli-Q. In this second tile Tomàs demonstrates Tektonik as a simple geometric form, a pentagon, enhanced with auras and shading. This tile uses the same concept as above with much more complexity from using string lines as the basis for Tektonik‘s shapes. (With 250 Strings in our TanglePatterns Strings resource, Tektonik might be taken on some interesting adventures.) Again enhanced with shading and auras. In this tile Tektonik is featured in an interesting “aperture”-like fashion with curved starting strokes. 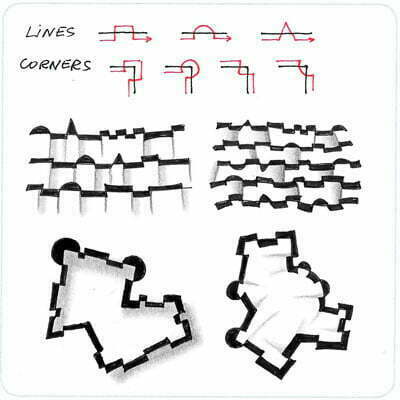 And finally, in this last tile Tomàs illustrates Tektonik in combinations with curves and triangles added to Tektonik‘s rectangles and he shows how to get around corners with these shapes. In Tektonik, a basically rectangular zigzag line (although it can also present curves or triangles) intersects a linear direction. This procedure defines rectangles, triangles or semicircles on each side of the line. There are two basic ways to propose this entanglement: the zigzag line can follow a closed or semi-closed path or can be organized in successive rows. The result changes considerably, but always has a constructive, solid and stepped aspect that can suggest stratified geological formations, but also walls or enclosures. Tekton is a Greek word meaning master builder. Tektonik therefore refers to the construction, but also to geology. So it seems to me an appropriate name. An alternate Tektonik Basic deconstruction shows an ideal alternative deconstruction for the application of this resource in successive rows. In this deconstruction, cross addresses can be added to the guidelines that will define the width of the “steps”. These lines can also be cut and displayed in a more random arrangement. It’s a matter of having fun and trying. 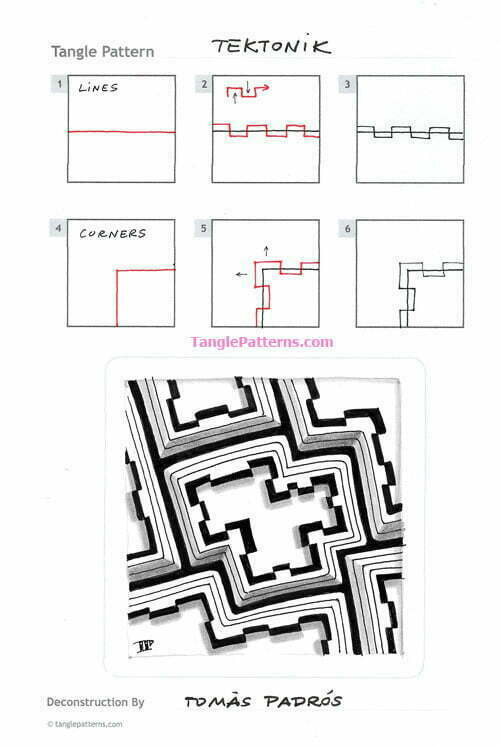 Tomàs illustrates his first set of step-by-step instructions for drawing Tektonik below, showing how the rectangular zigzag line is formed on the base line, and also how to deal with the corners when using Tektonik with geometric shapes. In this second set of steps Tomàs includes many potential variations of Tektonik in both rows and with different geometric shapes. 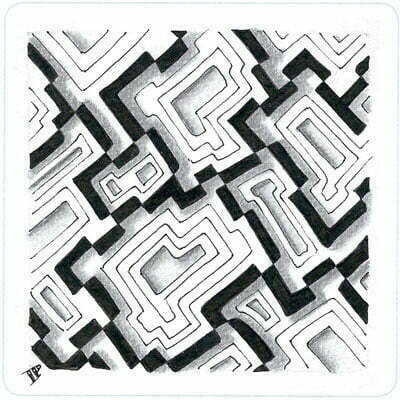 I used the top center version of Tektonik on the tile for my example above, the shading added gives such interesting looks to this tangle, making columns and dimension appear from the basic form. It strikes me that this can be considered an embellishment, similar to auras or perfs. You could add it to almost anything! Way cool, thanks! I’ve enjoyed Mr. Padros’ work for some time now, and always find his patterns to be absolutely delightful and intriguing to execute. This one, as well as Broadway, will be further happy additions to learn to draw, and I’m looking forward to them both. Thank you for offering such a complete tutorial on lines and corners, Tomas. 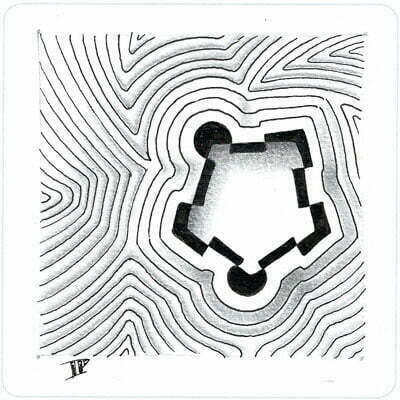 Your examples prompted me to experiment with Nipa (Zentangle original) and the Romancy technique as well. So versatile. Such a versatile tutorial, Tomas. Thank you. It prompted me to incorporate some Nipa and the Romancy technique (both by Zentangle) as well. Oh my GOODNESS there’s so much to explore with Tektonik!! It’s such a simple yet fascinating concept with loads of possibilities. 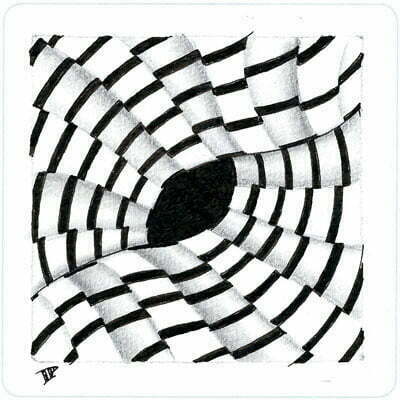 Thank you, Tomas, for this new tangle. I’m looking forward to hours of play. ?? ?